YAY Ah-Ha is back on 8TV at 10:30pm, Sundays, as Ah-Ha 2! Catch more educated Malaysian parody by Afdlin Shauki and Harith Iskandar! No, none of that Senario slapstick. What the heck, it was free anyway. If you are reading this, stop staring please. Remove only to plant wet noisy kisses. On Friday, an ex-schoolmate called for technical support. I solved his problem, then he asked when I was free. Next week perhaps? I then headed to the Mont Kiara Jazz Fest to catch Cosmic Funk Express with my colleague, and guess what? My ex-schoolmate came and joined us. He was my colleague’s churchmate. I haev major respect for him, as Paul and him are the only people around my age who paid for their own cars completely without the help of parents (okay there’s the help of a car loan…) Screw you kids who proudly insist “oh this is my car” but forget who paid downpayment. The next day I was online at the office, and an ex-colleague bugged me about some technical stuff. I then headed to Sunway Pyramid out of boredom, following colleagues to cover an event. Across the crowd, I spotted that ex-colleague! What excellent flow. We met up for some catching up, and she dropped me off at Subang Parade. I called the affable Nabila but alas! She was in Bangsar. I was thinking of a hearty Nando’s lunch and dinner (it was 6:30pm already!) when I remembered who I last had dinner at Nando’s Subang Parade with – Leech! I called, and found out she was in Subang Parade as well! 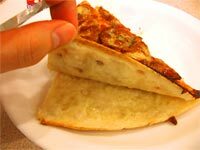 We then had double-cheesy pizza; interestingly, the extra cheese was in the crust instead of on top, so it wouldn’t slide about, moving the topping with it. Hannna then called just as we paid the bill, just like the last time, and Leech scuttled off like a crab again. Yes more pictures will come. Soon. This entry was posted in Pictures, Travelling on August 14, 2005 by 2konbla.